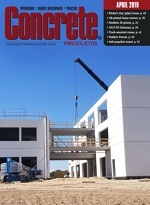 Sika Corp. dedicated an admixture and mortar production facility near Houston late last year. Geared to Texas and Southwest markets, the plant is the company’s 22nd in the U.S. and equipped for production of polymers central to high performance admixtures. New Philadelphia, Ohio-based Hines Specialty Vehicle Group has appointed Brian Dunkle as vice president of Operations, responsible for positioning and managing purchasing, materials, production, quality and facilities tied to Kimble Mixer and sister truck brands. He brings 20-plus years’ of operations experience, gained through leadership positions with companies including DM Hydraulic and Industrial Services, Tecnocap, Lauren, Allied Machine and World Kitchen. Separately, HSVG has named Lisa Hartong as Human Resources manager, tasked with monitoring, oversight and guidance of company-wide HR functions. Her 20-plus years in HR include positions with JLG Industries, J.M. Smucker Co. and A.R.E. Accessories. Daimler Trucks North America has appointed David Carson as chief diversity officer and Western Star Trucks president, following two years as Freightliner Custom Chassis Corp. president. Carson succeeds Kelley Platt who has been promoted within the Daimler AG global organization to president and chief executive officer of a truck joint venture, Beijing Foton Daimler Automotive Co., Ltd., in China. Volvo Construction Equipment President Martin Weissburg will transition in the same capacity to Mack Trucks in June 2018 and remain a Volvo Group Executive Board member. He served as president of Volvo Financial Services Americas from 2005 to 2010, when he was named to lead the global unit, and appointed to his present post in 2014. Based at the Mack Trucks Greensboro, N.C., headquarters, Weissburg succeeds Dennis Slagle, who will remain with the Volvo Group as a special projects leader reporting to CEO Martin Lundstedt. Ahead of an Atlas Copco Group spinoff and separate stock exchange listing, Epiroc AB has begun operating as an independent business, focused on infrastructure, mining and natural resources markets. A split proposed in January 2017 is on track but subject to an April 2018 shareholder approval. “Epiroc is devoted to providing customers with products and services that enhance their productivity, energy efficiency, safety and ergonomics,” says Turgay Ozan, president of Epiroc USA LLC, based in Commerce City, Colo., and encompassing 17 locations and a 370-member sales and service organization.